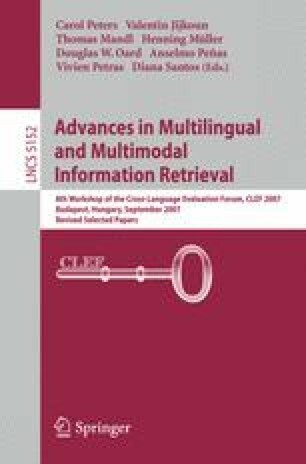 This paper reports on the participation of the University of Wolverhampton in the Multiple Language Question Answering (QA@CLEF) track of the CLEF 2007 campaign. We approached the Romanian to English cross-lingual task with a Question Answering (QA) system that processes a question in the source language (i.e. Romanian), translates the identified keywords into the target language (i.e. English), and finally searches for answers in the English document collection. We submitted one run of our system that has achieved an overall accuracy of 14%, and a precision over non-NIL answers of 33.73%. Error analysis revealed that this low performance is mainly due to the lack of a reliable translation methodology from the source in the target language. This work has been supported by the EU funded project QALL-ME (FP6 IST-033860).